What does CPI (Cost per Install) Fraud mean? How does it work and how can I protect my business from further damage? It’s the hard truth, but Fraud exists anywhere you go. Governments, Politicians and guess what, there are also fraudsters in the marketing and advertising industry. Especially performance based marketing is filled with suspicious activities. Fraudsters are stealing hard earned commissions from advertisers and networks like you. According to this article by Fortune Magazine Russian hackers have generated 3$ – 5$ million per day through Ad Fraud. Imagine how much money your business can lose if you don’t take the necessary steps to detect your fraudulent conversions. What is Digital Ad Fraud? In short, advertising fraud stands for a variety of crimes such as cookie stuffing, using bots/emulators to mimic human behaviour, Ad stacking, laundered ad impressions, fake installs and much more. Fraudsters steal billions of dollars every year and often the bad guys get away unnoticed. Ad Stacking and Impression Stacking describes the process to hide ads behind another and ad, so ultimately only the top ad can be seen whereas the others will remain unseen. It’s almost impossible for normal users to notice this type of fraud. Click Farms is a tactic that is heavily used by developing countries, where low-paid workers (often using VPNs)are clicking on advertising that they have no interest of (Picture below). These tactics are heavily used by countries such as China, India, Bangladesh and Venezuela. 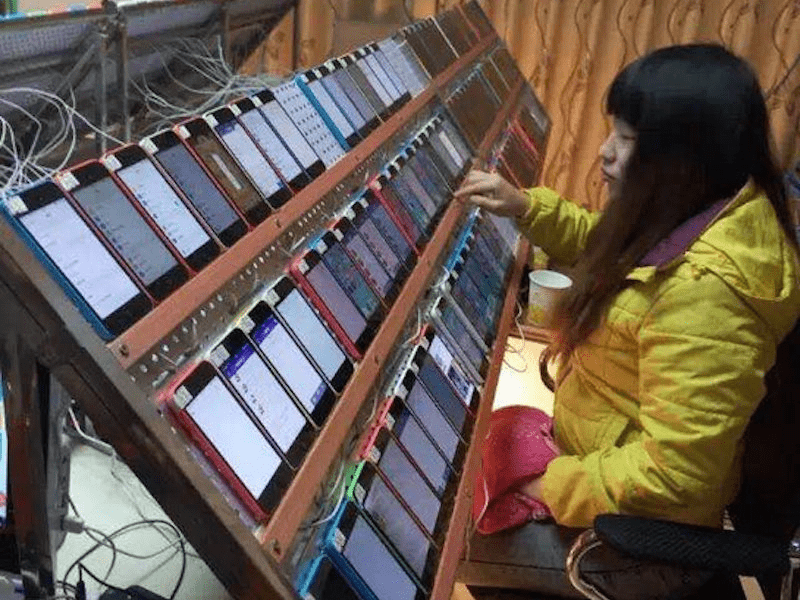 Source – Quora: Chinese Bot Farm to realize click fraud on a scale. Click Spam is one of the fastest growing fraud problems in the industry across all verticals. We explain the tactics of Click Spam in more detail in our help. Keep in mind that this problem is more complex than it looks at first glance. Don’t underestimate how many conversions are lost due to Click Spam / Click Injection, which can be a devastating threat to your business.